"The probable is what usually happens." 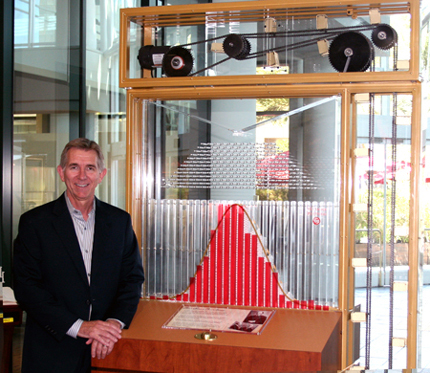 Say "HELLO" to Francis, IFA’s probability machine, named after Francis Galton, an English mathematician who was an expert in many scientific fields. 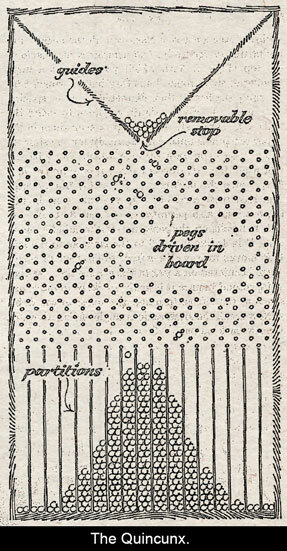 Galton’s probability machine demonstrates how a normal distribution is created through the course of random events. IFA commissioned the creation of Francis to better communicate to investors the probability of outcomes of a portfolio that result from a series of random events such as news stories about a company or about capitalism, in general. Source: Lady Luck The Theory of Probability by Warren Weaver, page 261. As you can see, the random falling of the beads ultimately forms a normal distribution that is represented by the bell-shaped curve. As you can also see, the distribution of the beads in the photograph bears a striking resemblance to the distribution of 600 monthly returns (50 years) for IFA’s Index Portfolio 100 which is indicated by the red overlay. Like the random distribution displayed by Francis, Index Portfolio 100 carries a wide range of outcomes or a high standard deviation, but maintains a normal distribution with about a 1.13% average monthly return over the last 600 months, but with much short-term volatility. We know that markets are moved by news which is both random and unpredictable and this news is rapidly incorporated into stock market prices. The degree to which your investment portfolio is exposed to the equities, and therefore vulnerable to equity market-moving news goes a long way to explain the expected range of outcomes the portfolio will experience. Investment portfolios with higher standard deviations have greater uncertainty of returns, but when properly constructed they carry higher expected returns. This relationship between an investment’s level of risk and its expected return is the classic economic trade-off. The figures below illustrate the difference between the bell-shaped curves of the 600 monthly returns for the high-risk Index Portfolio 100 which carries a wide range of outcomes versus a low-risk Index Portfolio 10 which carries a narrow range of outcomes. The 100% equity Index Portfolio 100 endured greater price swings than the 10% equity and 90% fixed income allocation of Index Portfolio 10, but had higher returns. Over the time period shown, a dollar invested in Index Portfolio 10 would have grown to a fraction of what a dollar invested in Index Portfolio 100 would have grown to. This historical data supports the presumption that investors who have higher risk capacities are expected to earn higher returns. A caveat: be certain that you can handle the wide range of short-term outcomes (volatility) that travels in lock-step with higher returns. Those who liquidated their portfolio in the latter part of 2008 or up to March 9, 2009 have paid a steep price for doubting the resilience of capitalism. IFA's Index Portfolio 100 delivered a 183% total return in the five year period from April 1, 2009 to March 31, 2014.